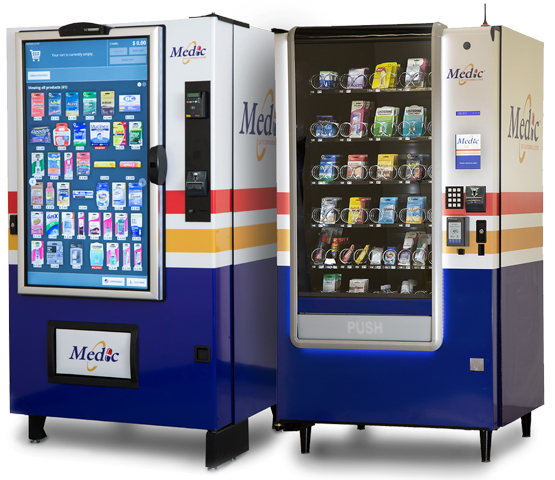 We are Medic, a health and wellness vending services company specializing in the sale of over-the-counter medications and personal care items through our 24/7 Convenience Centers. The 24/7 Convenience Center delivers brand over-the-counter (OTC) medications and personal care items via an interactive experience using digital media for health information and promotion. Whether it’s the 7-inch screen on our Automated center, or the 46” HD screen on our Digital center, our 24/7 Convenience Centers allow our customers to review important drug and product facts before the purchase. Headache? Heartburn? Low Energy? Medic can help. From a selection of over 60 brand OTC medications and personal care items, each 24/7 Convenience Center is customized with the products you need for safe and convenient relief.